How would you like to increase your production by $50, $100 or even $200 per hour? Does the concept of hiring a Physical Therapist sound great to you – except for the expense? Are you tired of $20-30 reimbursements for your care and limited number of chiropractic visits? Do you want to increase your income, without necessarily increasing the hours you work? Is your office in danger of “chiropractic extinction” because you only provide one basic service? Would you be able to handle more new patients, better profitability and better patient compliance? Are you anxious, tired, frustrated, under-appreciated or uncertain about thriving in today’s chiropractic marketplace? Doctor, if these have asked yourself ANY of these questions, read on – there is good news ahead! According to Chiropractic Economics magazine, integrated practices show an income considerably higher than the average practice ($252,071) when compared to solo chiropractors ($130,546). Other economic indicators are just as clear: many insurance plans are continuing to severely limit chiropractic care in favor of rehabilitation, physical medicine or physical therapy benefits. Not only do these services get more visits, many (if not most) pay better than our chiropractic adjustments as well. It’s time to get your practice into the 21st century and deliver superior care with maximum convenience to your patients and a better bottom line for you! Doing “business as usual” is NOT working for many chiropractors. For decades chiropractors have adjusted their patients (and been paid), gave their patients exercise instruction, tips on self-care and home management (most of which they for free) and received great results (but decreasing reimbursements). The writing is on the wall. The pay we receive for our adjustments is going down steadily. Insurance companies are giving less chiropractic benefits but paying more for rehab and physical therapy services – many of which we are doing but not being paid for! Claims adjusters, IMEs and Personal Injury claims examiners continue to ask when we are going to transition the patient to active care. The Six-Figure Income Boost That You are Missing! On the flip side, there is a growing number of chiropractors who are not only delivering top-notch care but receiving BETTER income because of it. These DC’s are not PT wanna-be’s or hacks who don’t adjust and simply “cook” their patients on an endless number of modalities until the insurance runs dry. On the contrary, these doctors have “discovered” that they can complement their chiropractic care with the same level of care they have been providing AND be paid for it. Without adding an MD, PT or expensive equipment to their practice. In fact, these doctors have created a 6 Figure Increases in their practice! 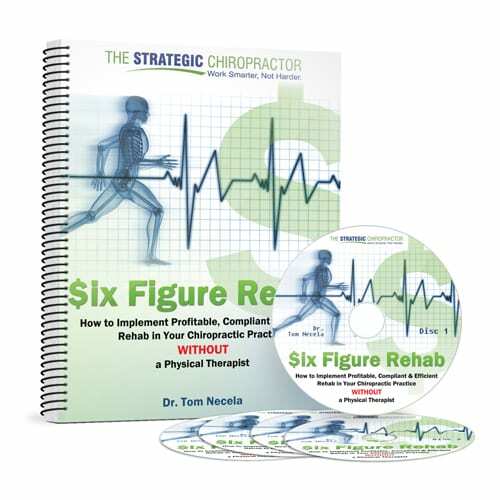 If this sounds appealing to you, read on – 6 Figure Rehab may be the key that unlocks the door to the successful and profitable implementation of these services within your chiropractic practice! Low startup costs = quick ROI. Put the extra space to good use in your office and quickly generate income! How find, hire and keep the RIGHT rehab assistant at the RIGHT cost. When to hire additional staff to keep the profits rolling! How to implement rehab from the start – even for small practices! IF You KNOW You Have MORE Earning Potential but Just Don’t Know How to Tap It…this program is for YOU!! What’s Included in the 6 Figure Rehab Program? Basically, everything you need to get this incredible income producer set up in your practice is “boxed up” in the “6 Figure Rehab” program.